I wrote a post titled “I Hate Goats“. It was one of my first goat posts and I still stand by a lot of what I said in that post. That being said I have learned a thing or two about how to keep them quiet…ish. And since you’re probably already pulling your hair out let’s just get right to it, shall we? 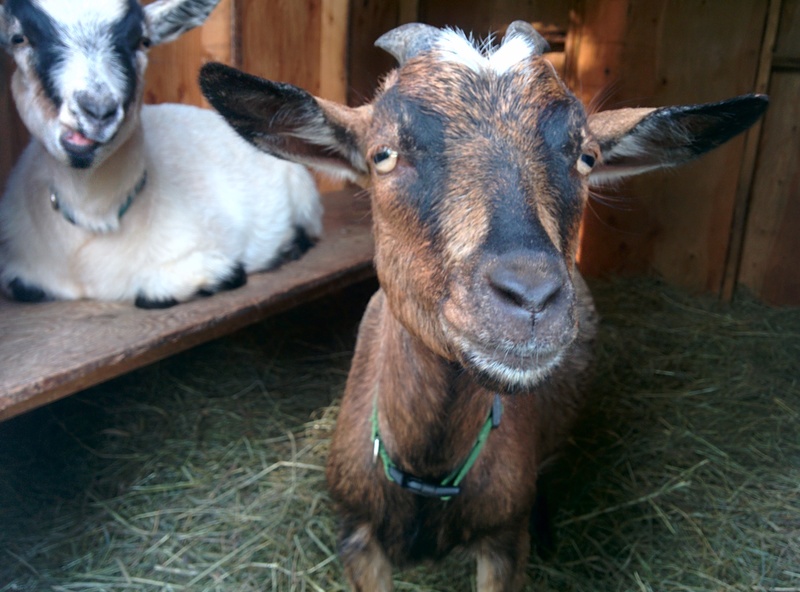 Here are my tips for not letting goats….well, get your goat. 1. Have a schedule and keep to it. Implement a routine. Goats love routine, I suppose it helps them feel secure because they know what’s going to happen each day, and when they are going to get fed (the most important part of the day for a goat). It took several days for them to figure out that constant crying was no longer going to get them new hay. But thank the good Lord they FINALLY did figure it out! So be strict with them and yourself. Decide when is the best time for feeding time and stick to it! Now, if I am a few minutes late they start the charade, but I was the one who was late so I suppose I deserve to be yelled at. Every goat is different when it comes to adjusting to their new home and surroundings. My two goats came from two different herds. They were both pulled away from their mothers and fellow herd mates, stuffed together into a dog crate in the back of a strange SUV and driven thirty minutes to a new home with new smells and sounds. They didn’t know each other and they didn’t know me. Some goats adjust fairly quickly, others pretty slow. It took mine about 3 months to finally settle in. Yes, you did read that right. 3 months! Goats naturally live in herds, unfortunately for me my goats quickly labelled me as one of their herd mates. This was fine until I left them alone. In their mind I was lost so it was their mission to “call me” until I came back. You know, for my own protection and stuff. To not get into that mess be sure to introduce yourself to your new goats, but also give them space and time to adjust to their new home without you. If your goats already know you, but seem to have developed the same separation anxiety mine did, continue on to the next point. 4. It’s OK to let them cry. Because my goats were always calling me (and when I say calling me I mean screaming for me) I began the dangerous cycle of giving them more hay to keep them quiet. That works for about as long as it takes for them to eat the hay and then it starts over again. Do not get into that trap! Take it from me, it is hard to get out of that. So here’s what you do: you establish a routine (as stated in point 1), and you stick to it. Feed and walk away. The screaming is dreadful. Phoebe has one of those cries that knocks around in your head and makes you want to cut off your ears so you don’t have to hear it. But then something magical will happen. Slowly the crying will decrease. Soon it’ll be just a little bit when they see you walk away, until finally no crying at all. 5. Make sure you are prepared for goats. We weren’t prepared. We rushed into it way too fast. May was a very busy month for us, with a ton of changes that happened all at once. Because of this we were thrown off course with our goat plans. The only thing that was set in stone was that they were coming June 20th. I brought them home in the afternoon, but their barn was not finished until that night. We had no fences in, so we tied them out. We tried this for several months and it was just not for our goats. I know several people who tie out their goats and it works well for them. It was nice because we had so much land that need clearing we just moved their ropes each day to a different section of land, and let them eat away, but we have trees and rocks and all sorts of things for them to get tangled around. So we opted for a fence. And dug every blasted hole for the fence posts by hand. But it was worth it. They run and jump and play more than they ever did before. We did get a bonus out of it however, our goats are leash trained. They walk better on a leash than my dogs do! 6. Never underestimate the power of a good treat. For my girls it’s raisins. Once they started getting better at being left alone I would periodically go out and give them a raisin and a good pat. Then walk away. At first they would cry a little bit, but now when I go out they come running to greet me (even though I very rarely give them raisins anymore), and they accept that when I’m leaving I’m leaving, but I will come back (maybe even with the kitchen scrap bucket!). Don’t completely ignore your goats, just set time for visiting and walk away when you’re done, no matter how much they cry. 7. BE SURE THEY HAVE A BUDDY! I CAN NOT stress this point enough. A single goat is a lonely goat, and a lonely goat is a loud goat. Goats have very strong herd instincts. It’s what makes them feel safe, it’s what gives them confidence and it’s what stops them from actually loosing their mind. A lonely goat will go insane. They are an animal that *hear me now* can not be alone. If you have a lone goat that is probably the #1 reason it is crying. Get it a buddy. Like yesterday. It’s been quite the journey, but I now have quiet(ish) goats. They still talk to each other and make little barnyard noises, but there is no longer the constant screaming. So what are my thoughts on goats now? Well they’re ok. I guess. If nothing else you do get used to them. 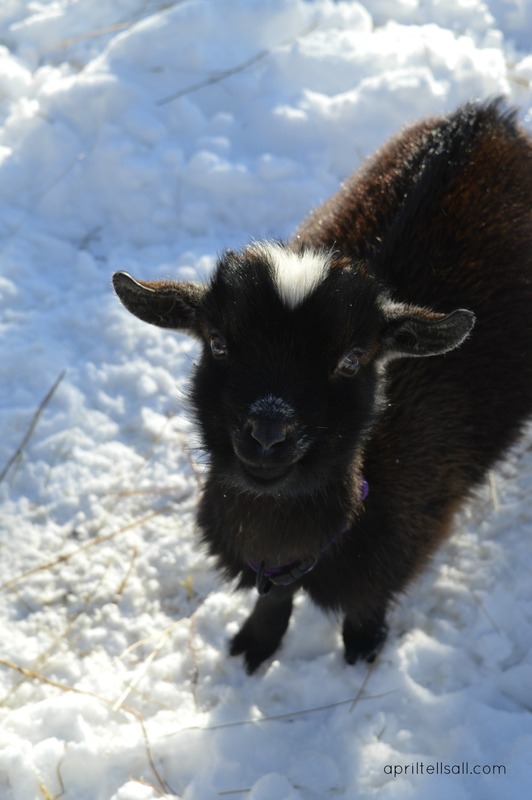 A Simple Guide For The First Time Goat Owner – aka everything you need to know about keeping happy and healthy goats. 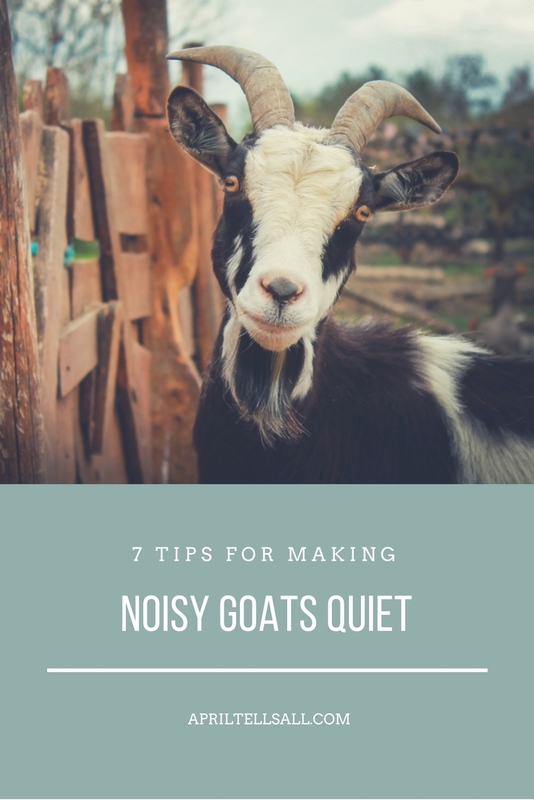 My Goats Are Too Noisy – I share my wisdom after owning goats for 2 years in this post. Yes, they’re still loud but here are a few other ways of dealing with it. My Goats Are Too Noisy! Those are such good suggestions, April – all true! I love my goats but they can be noisy, and Nubians are the noisiest breed to begin with. Yes I’ve heard some terrible things about Nubians! I’ve got Nigerian Dwarfs, and I’m pretty sure they’re the second noisiest breed. Glad you enjoyed the post. We had a similar situation when we purchased a 2 year old and 4 year old doe. They were attached to the larger herd that they came from, and we compounded the problem by spending lots of time with them the first few days to settle them down. Just like you, our barn was a day or two behind, so putting the roof on while the goats were already stressed was a really bad move. After 4 or 5 days, the noise turned into constant screaming. I was worried the neighbors would call the police, because it sounded like the goats were being burned alive. Our solution was bringing in a third goat. The new addition was a herd queen, and was very confident in herself. The original two does immediately settled down, and there was no noise at all within a couple days. This week we returned the herd queen to her old ranch, and now one of the two original does is back to her old ways. Screaming for us every time we leave her. It’s terrible, but we hope she’ll settle down in a few more weeks. Yikes, I hope she calms down soon for you! Screaming goats are so unpleasant! Hi Sandy, sorry for the late reply. I hope you got your goat situation worked out! Personally, I would look into selling her if it was me. It’s not fair to keep a single goat alone – they depend on their herd mates for security. All the best! I have a 8 week old kid. He is one of our three animals, the other two are dogs. I thought the dogs and the goat would bond and that the kid would see them as his herd. So far they all like each other and the goat does climb on my big sweet 120 lb Alaskan Malamute but they don’t really play or hang out together very much. Are my dogs enough to keep my kid feeling secure and not lonely? I think it depends on the goat. Does he cry a lot when he’s alone? Or try to escape all the time? He might feel secure enough with the dogs being near by, even if they’re not right together all the time. As long as the dogs don’t chase him and cause him stress he may well be fine. My male goat is whining around my female, he never done that before. She’s probably in heat. 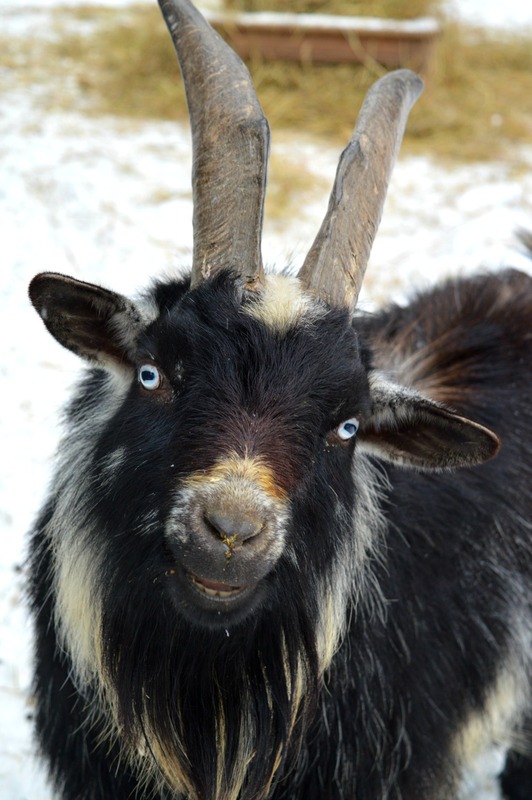 Male goats make a bunch of noises to try to impress a female – including whining, snorting, and babbling! I’ve had 2 Nubians (brother and sister, Coffee and Cream) for 17 years. But I just lost the male (Coffee) in July this year. I’ve been worried about Cream being alone. She’s done very well until just a couple weeks ago after she went into heat. Now she cries a lot. Even when I’m outside with her. My goats are pets and are more like dogs, actually. I try to give Cream lots of attention now she’s alone. Do you suggest getting her another companion at her age?? I’m hesitant to do that since the vet suggested another goat may be mean to her. They told me IF I got another one, I should try to find an older, calmer animal. But I would want 2 so I don’t run into this problem again. What do you suggest? Thanks for your reply, April. I had the vet out last week to check on Cream. Turns out she had a pseudo pregnancy and the vet expressed “serum” (I believe she said), no milk. But the vet said once her hormones die down, she will be more content. The vet again advised against getting another goat (or goats) due to Cream’s age. She also said that Cream really is not alone since she’s outside with a few cats and my chickens and ducks. And, of course, she has us and we spend a lot of time with her as well. Cream has already settled down some and is getting back to her normal self. She’s such a sweetheart and I hope we can keep her happy for years to come. I have two fainting goats (both girls Baby & Gabbie) I have had them for about a year, I have never had a problem with them being loud in the past but they are both currently being very loud, I am in a pilot project and am worried that the noise might have an effect on the outcome of the project. I have been making sure that they have water, hay, food, salt lick, and live but they are constantly bleating at us. Do you have any idea on what could be bugging them? I also don’t know if they are in heat or not. Hi Jillian, my guess is they’re in heat if this is new behaviour for them. I have found that my girls cycle all around the same time, so it could be that is what is happening with your girls too. Makes for double the noise! Thanks for your article. I’m in such a pickle with my boy Norbert. He has lived here his entire 13 years of life. His best friend from forever, Max, died last year, so we replaced him on a borrowing basis with Geddie, a younger mellow fat boy who we fell head over heels in love with, to keep him company. Well, tragically and unexpectedly, Geddie passed away 3 weeks ago with likely cancer per the vet, and now Norbie is alone. We do NOT want to keep getting goats or other animals; we’re at the point where we need flexibility to travel to help aging parents, so we’re trying to size down after all these years. So what the heck do you do with a very lonely and quite old but healthy goat who has never lived anywhere else and has always been nervous to begin with? I sit with him as much as possible, but I also have to work. My two baby’s are twin brothers they are Pygmy goats and they are 4 months old. I love them with all my heart there names are Elliott and Oliver and it breaks my heart when they cry, but I am a online student it it breaks my focus when they do this, is there anything else that would work? I’m exited to try any suggestions. Honestly I think they just need time. How long have you had them? It is terrible to hear them cry but sometimes you need to just let them cry it out. They’ll quiet down when they realize you won’t coming running every time they yell.